Sometimes things can get a little twisted around here. 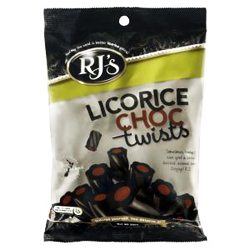 LICORICE TWIST - Wheat Flour, Sugar, Molasses, Glucose syrup (Wheat, Corn), Water, Liquorice Extract, Treacle, Humectant (E422), Rice Bran Oil, Salt, Flavour (Aniseed Oil). CENTRE FILLING - Sugar, Vegetable Fat (Palm Kernel Oil, Coconut Oil), Whey Powder, Skimmed Milk Powder, Cocoa Powder, Emulsifiers (Soy Lecithin, E476), Vanillin, 4% Cocoa Solids, 24% Milk Solids.